Archaeology is the latest fad. I was buried under Borderlands yesterday and missed the diligent digging that was going on in Fortnite, specifically in a new excavation site that has popped up north west of Paradise Palms. Players have had to mine dirt and boulders with lots and lots of health to find out what's hidden beneath. Like the breakable iceberg in the last season, the excavation site can be chipped away at by hard-working players, with some even finding ways to let everyone know they're friendly, just in case anyone wants to join them for a spot of digging around in the dirt. Luckily, all the combined damage from everyone mining across the game has been taken into account, so work has progressed quickly. Players discovered bones sticking out of the ground—watch them get dug up here—along with a small teddy bear, a truck and a chest. Further down, a volcanic vent, like the kind that boost you up into the air, was unearthed, too. It's all been dug up fairly quickly, so maybe this is just the start of a big excavation hunt, hiding more chests, vents and other hidden items. 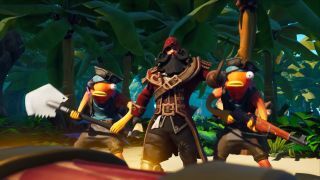 It seems like way too much effort on Epic's part for just what's been found so far. Expect to get some more use out of your pickaxe. Check out the rest of what was introduced in Fortnite 8.20, including poison dart traps and healthy snacks.